On the hill ... we welcome everyone with open arms. 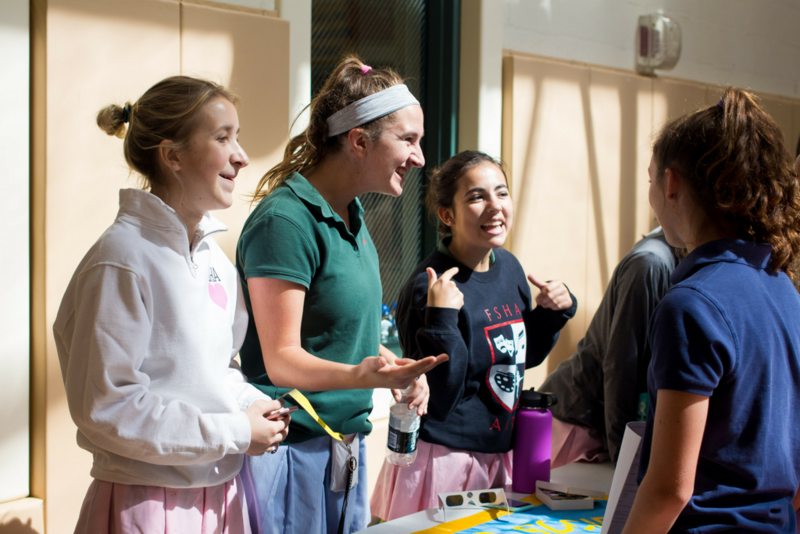 There are more than 20 campus organizations at Flintridge Sacred Heart Academy that allow students to indulge their interests and learn to lead. 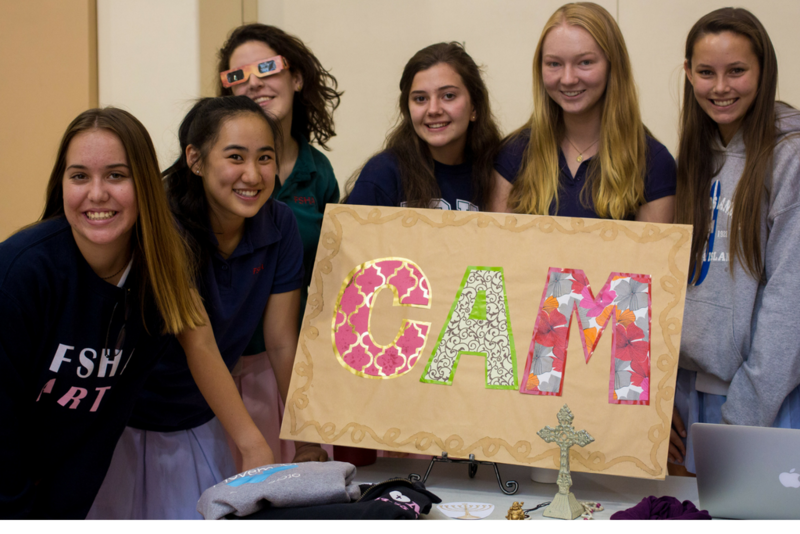 Students at Flintridge Sacred Heart Academy are encouraged to actively participate in the many club opportunities available to them on campus. The Academic Decathlon and the Speech & Debate Team put their skills to the test in competitions across the state and country. Our Academic Decathlon Team took home 36 medals (team and individual) last year. A small but mighty group, our Speech & Debate Team has also enjoyed much success in the past few years, celebrating a first Tournament of Champions qualifier (Monica Amestoy ’13), a first State Championship qualifier (Dani Chavez ’14), a National Speech & Debate Association Academic All-American (Maddie Collins ’15) and several League Sweepstakes awards. There are opportunities for every student to find her interest niche from Amnesty International to Theatre Club, Cooking Club to Aloha Kai (coastal environment awareness and aid). Classes band together to plan events such as dances, and they intermingle through the Big-Little Sister and Middle Sister programs, which pairs seniors with freshmen and sophomores with juniors. The sets of sisters meet for lunch several times during the year, with freshmen traditionally planning the Senior Brunch the Friday before Graduation. The Student Council takes a leading role in planning on-campus activities, including an always-fun Halloween celebration and the yearly Spirit Week. Academic Decathlon is a team that studies material in 10 academic disciplines to prepare for a one-day competition sponsored by the United States Academic Decathlon. The team is divided into three sections based on GPA — honors: 3.76 and higher; scholastic: 3.0 to 3.75; and varsity: 2.99 and below. Team members typically devote 15-20 hours per week to study and prepare. Team membership earns credit for a one-semester course. Flintridge Sacred Heart Academy’s Aloha Kai Club, which means “for love of the sea,” raises awareness for the importance of ocean conservation and provides ways for our community to support local marine organizations by participating in activities that work to preserve marine environments and facilitate a love for the ocean. We further our school’s focus on the pillar of service in the form of stewardship of the land and water, and we strengthen the fundamental bond between the FSHA community and our local marine life. 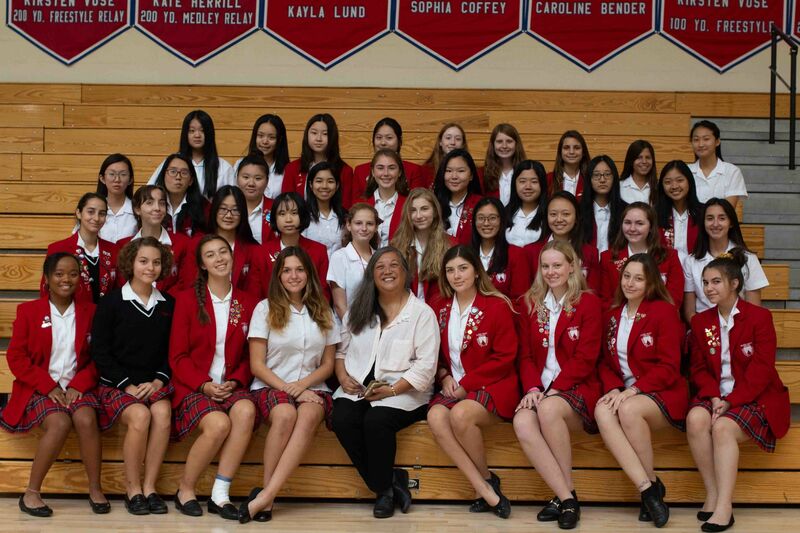 As representatives of Flintridge Sacred Heart Academy, Ambassadors serve as a bridge between current Tologs, their families, friends, alumnae and prospective students and their families. 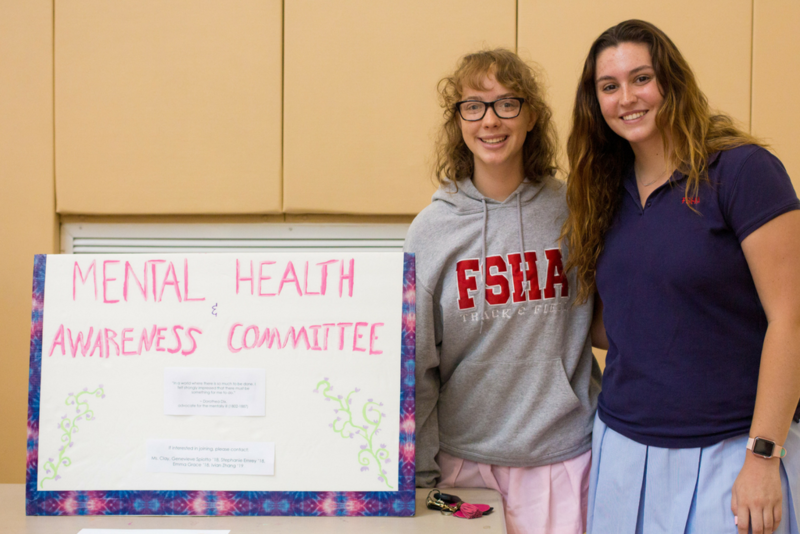 As a member of this co-curricular club, students will act as the face of FSHA at various admissions events and recruiting activities. By expressing our enthusiasm for our school, we are able to share beyond what is offered solely through our academic, fine arts, religious and athletic programs, to emphasize the pillar of community present and alive on our campus.The bridges we create serve as an everlasting bond of friendship between all Tologs and accept new students into our bond of friendship on the hill. Amnesty International, a service and community based club, strives to inform and take action against the social injustices around the world. Our club embodies Veritas by actively seeking the truth within the fight for human rights while enriching our knowledge on these issues on an international level. The Armenian Club’s mission is to inform and educate the Flintridge Sacred Heart Academy community about Armenian culture, to serve by promoting cultural diversity, and incorporate the four pillars (study, prayer, service and community). Through our study, we can inform and educate fellow Tologs by encouraging students to learn more about the cultural background and history of those around them. Through prayer, we can unite as a club and pray for those in need. Through our service, we can walk in fellowship with those in need. And finally, with the community, our club will provide the opportunity to connect through the Armenian language, food, music, dance, history and much more. The mission and philosophy of FSHA's Art Club is to unite students with a bonding love through introduction, appreciation and expression for the visual arts (including painting, drawing, graphic design, ceramic). As a community we want to come together, and express this love, and reach out and touch others through visual arts. We believe that all should have the opportunity to express themselves in forms of artistic personal experiences and religion and will make the study of art possible for all, especially through fundraising and donations of art and finances. Art club supports others in the community who have fewer opportunities to express themselves through art. With lessons of Veritas at FSHA, we are able to show our true emotions in our art work. We study a variety art forms at FSHA. Students are able to express themselves, and their true feelings through art on more personal levels. We appreciate the value of this club because it allows us to come together with students outside of our friend groups who have similar interests to us and develop a new “sisterhood” from that. Art Club works to incorporate meditative practice, as many utilize their artwork to communicate feeling. Art can be a form of prayer, as people are communicating to God the best way that they can. Just as art is a very important part of religion, it can be transformed into prayer. The Associated Student Body (ASB) is the student government at Flintridge Sacred Heart Academy. Student responsibilities for officers of this organization include leading student council meetings, planning, advertising and executing student activities, leading the campus in faith activities and providing a student voice in communicating with the school's administrative bodies. 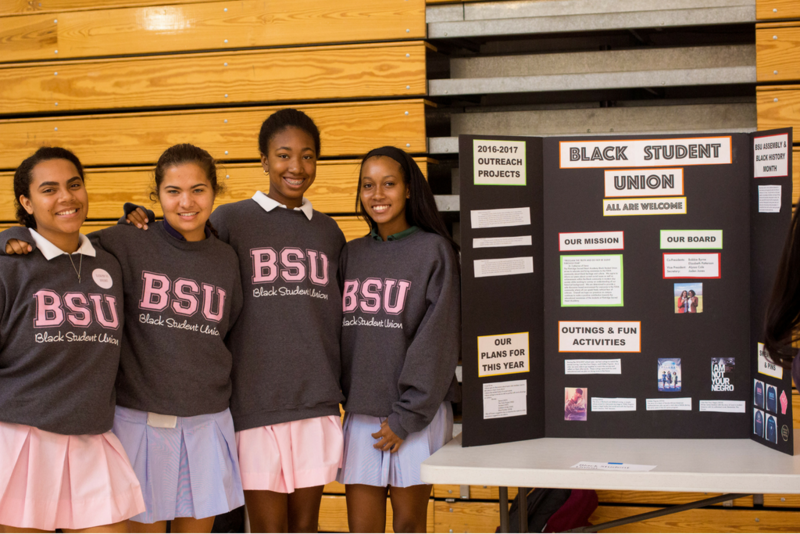 The Flintridge Sacred Heart Academy Black Student Union strives to educate and promote black heritage and culture throughout the student body, faculty, and community, giving minorities another place to feel accepted, and at home. The Boarding Hall Council is an active representative body of the resident component of FSHA, which consists of students from all over the world. We provide boarding students with unconditional support through the rigorous, four year high school program by helping them maximize their potential. 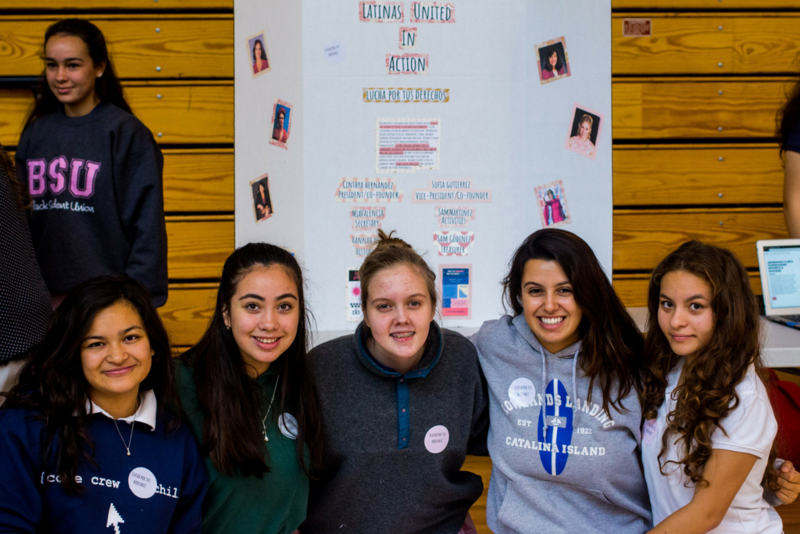 By helping them embark on a meaningful experience both socially and emotionally throughout their high school careers, we encourage boarding students to embrace their unique identities and capabilities and build their self-esteem. We hope to achieve this by providing a comfortable, fair, and welcoming environment. We honor the Dominican pillars of community and study because, as a boarding community, it is crucial that students feel at home and develop a special sisterly bond with one another. Moreover, the Boarding Hall Council provides students with infinite support and help in becoming a woman of faith, integrity, and truth. The goal of this club is to recognize scholastic achievement and to promote service. Members must earn a minimum of three As and a total of 10 points in designated subjects. They must submit a letter to the CSF moderator expressing a desire to join. Membership is reviewed by semester. Students must apply for membership each semester. The Christian Action Movement seeks to prepare young women to make positive and meaningful contributions to the world and those in need. We will integrate three of our pillars in our co-curricular group through prayer and service to the community. 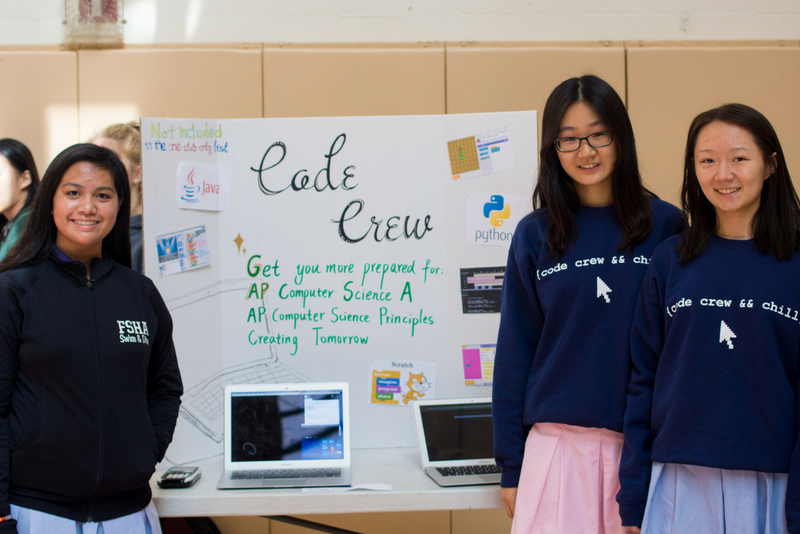 The Code Crew is a community of students who wish to explore programming for web design, gaming, application development, robotics, or just for the fun of it! It is open to all students at any skill level. Comedy Sportz is an improvisational group (auditioned cast) that competes with local teams from schools in the surrounding area. The team also sponsors alumnae and faculty matches. This group works with a coach to develop all skills surrounding performance to “improve”! The C’est La Vie Club brings cultural awareness to the FSHA community, and sparks interest for our Tologs through activities and opportunities that introduce France’s dynamic language and culture. C’est La Vie motivates young women to create a multicultural community (pillar of community) with strong bondings and active interactions by studying foreign culture and assisting French-related communities through various outreach programs (pillar of service). The mission of Feminists In Action is to dispel common negative connotations of the word “feminist” and further re-educate the FSHA community about the feminist movement (in a positive way). In educating Tologs about equality and to act against injustice, the club establishes an open forum that stresses integrity and faith with an emphasis on sisterhood and friendship both in our members and ourselves. All members have the opportunity to voice their opinions and concerns without judgment. Our goal as a club is not only to empower the women here at FSHA, but also to be a voice in the fight against gender-bias and oppression. FIA helps unite all the members of the FSHA community, expanding our sisterhood by embracing different beliefs and opinions, representing the pillar of community as we unify as one! Our mission is to inspire girls who have an affinity or interest in filmmaking or acting and to encourage them to pursue their dreams in a safe and accepting environment. Senior Dance Company was initially formed in 1993 to perform at school functions and as an entertainment service for the community. A Junior Company was formed in 2003. Chosen through audition, the highly creative, “professional” companies work once a week toward a specific performance. In addition, we also have a Hip Hop Company and a Liturgical Movement Company. 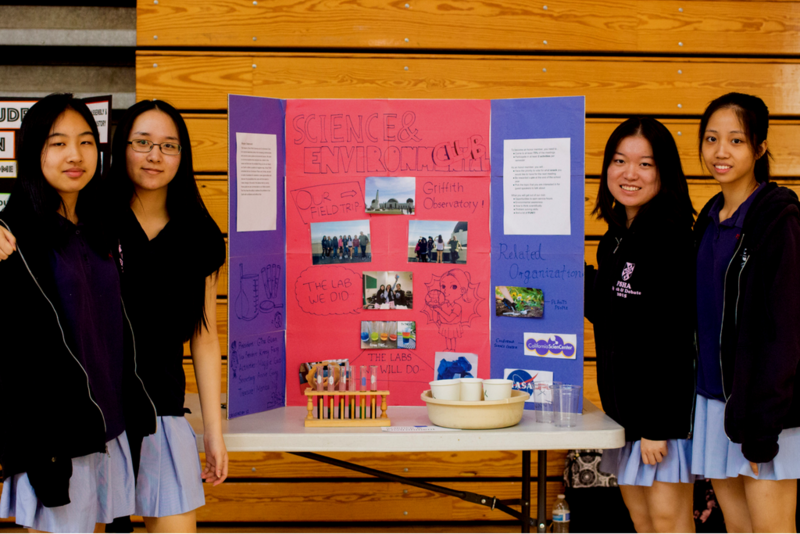 The Forensics Science club’s mission is to educate the students of Flintridge Sacred Heart Academy on criminology, nutritional science, kinesiology and forensics science. We give students the opportunity to explore the techniques, instruments, and skills that could potentially inspire a passion in the field of forensic science. Forensic science is primarily centered around discovering the truth around the injustice in the world that is caused by criminals. As Dominicans who practice the Four Pillars we will act through the club to serve the community and our fellow Tologs by holding activities, educational meetings, and an outreach program to demonstrate how forensic science can offer a person an excellent career. 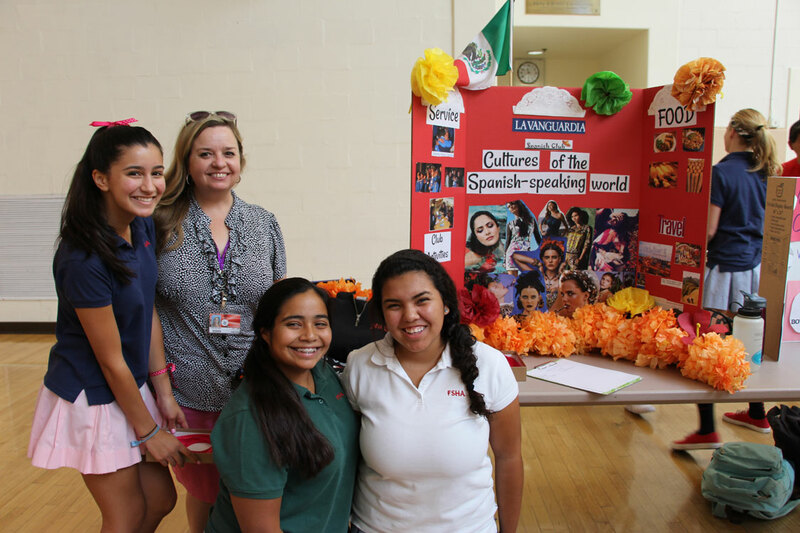 The mission of La Vanguardia is to educate and expose FSHA students to the culture of the Spanish-speaking world. The most important aspect of this club is its adherence to the pillars of service, community, and study in educational outreach (both locally in inner-city Los Angeles and abroad in Mexico). The club embraces and immerses members in different aspects of Hispanic and Latino culture through fun bonding activities that include unique food, music, and film. Mu Alpha Theta recognizes achievement, commitment and academic excellence in mathematics. 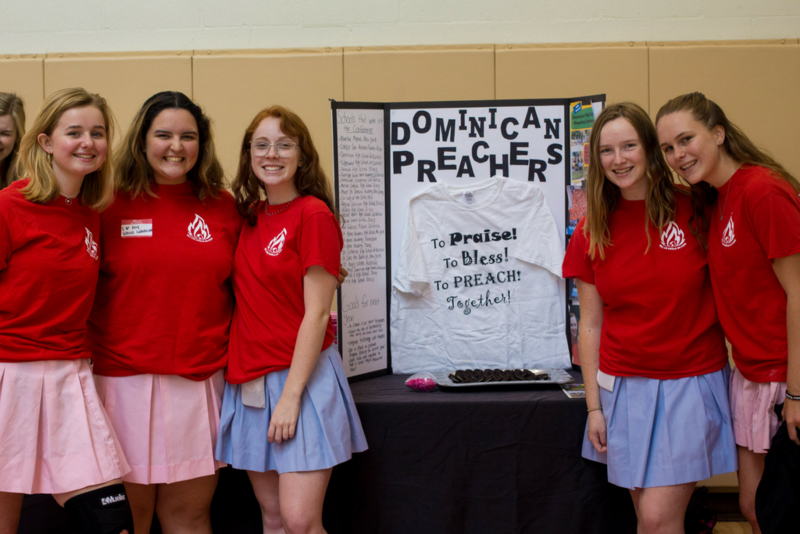 Members of the club represent the Dominican pillars of community, service and study by assisting others in mathematics, raising money to support an underprivileged school’s mathematics program, and showing hardwork and dedication. With the motto of “leadership, scholarship, service” as their guide, members are selected for lifelong membership in the National Honor Society. Membership is based on academic achievement (a “B” average), service, leadership ability and character. Members are selected by a faculty committee. The mission of FSHA’s Photography Club is to gather students who have an interest in photography and film and to help increase their interest, knowledge, and technique in digital art, and to discover the beauty of the world through the eyes of a camera. It will create bonds between members, and they will be able to express themselves through outings to take pictures together, watch films, share photography, and have conversations about techniques. The Photography Club encourages Tologs to look deeper into the world around us using photography and film. We will reach out and support others through auctioning our photography and donating the money we receive to underprivileged schools. We will also host workshop classes either for free or for a small fee and host movie nights where we will sell candy and donate the money received to art foundations. In our own FSHA community we will help to film or take photos of events for others. The mission of Science and Environmental Club is to point out the importance of building friendship with the earth and environment. The Science and Environmental club provides students a community (Dominican Pillar of community) for those who are interested in science to work with each other, to create bonds, to develop friendships, and to prepare for future studies (Dominican Pillar of study) learning about our earth. It is a great opportunity for the students to get involved in protecting our earth and learning about current environmental issues. This club will help more people be aware of the problems of the earth to start to make changes, little by little. The mission of the FSHA Speech and Debate Team is to promote and encourage excellence in the competitive activity of Speech and Debate. Using the pillars of prayer, study, service and community, and our school's mission of faith, integrity, and truth, our team strives to work hard and have fun while accomplishing our goals of becoming more comfortable in the area of public speaking. Speech and Debate helps girls to find their voice and become more confident in themselves as well as speaking in front of others. 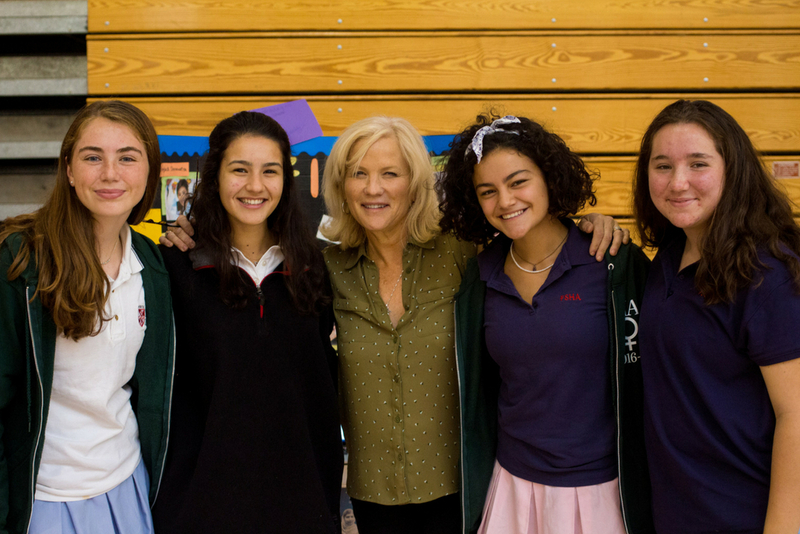 The Student Relations Alumnae Committee is an active part of Flintridge Sacred Heart Academy to offer continued connection between alumni and current students by stressing the essential Dominican pillar of community, in the movement to establish lifelong sisterhood. The mission of the Theatre Club is to nurture creative interests and provide an outlet where our theatrical endeavors can not only fulfill ourselves as thespians, but also the children of Santa Teresita who benefit from our outreach project. We live by the Dominican pillars of service and community as we strive to bring together our club body to achieve our goals through our many activities. In the spirit of the theme of friendship, our club plans to achieve a more consolidated and sisterly relationship between one another through our common interests in theater. The Young Writer’s Society, a group made up of anyone and everyone who has a love of writing and literature, seeks to be an outlet of creativity and to give young women the opportunity to creatively express themselves in a constructive manner. In writing, young women find the truth about who they are and solidarity in those that share their mindset. Study is incorporated through the process of revision in writing, service is achieved through the sharing of literacy and art in the literary magazine, and prayer is found when young women search their hearts to put their feelings onto paper for the glory of God.